Ony Carcamo in "Bubble Gang"
Ony Carcamo in "Comedy Bar"
Ony Carcamo's unique talent plus his experience in advertising, marketing, and journalism can help you get your company's message across your partners and customers. 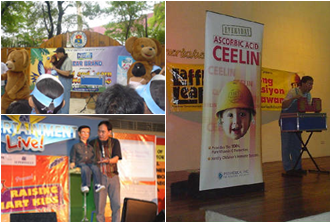 Since 2000, he has been regularly booked by top corporations to organize and/or perform in school tours, mall events, product launches, banquets, trade shows, sales conventions, and other company activities, like internal parties and trainings. Because he is a professional writer, he customizes his shows to better fit the occasions. He makes sure your beloved audience/clients/partners are entertained while you are also meeting your company's business objectives. Nestle Philippines, Smart Communications, Unilab, Department of Education, Museo Pambata, Caltex, RFM, URC, Abbott Diagnostics, Powerbooks, Kodak Philippines, ABS-CBN, GMA, PDIC, Dole Philippines, Basic Advertising, Publicis-AMA, McCann-Erickson, Bayer, AIDS Foundation of the Philippines, M.Y. San, Adarna House, Glaxo Smith Kline, Quezon City and Manila government.